It’s here!! It’s finally here!! Can you smell it? The beautiful smells of cinnamon, pine, and chocolate, but not at the same time..LOL! The three smells that I absolutely cannot get enough of when it comes to the holidays! And it’s the year’s annual baking frenzy, which gets me all excited, especially this year because I haven’t gotten into this frenzy in a few years, either because I was busy with a baby or fighting with my dad’s health insurance for over a month. This year I got my mixer and I’m gonna use it!! But before I get myself knee-deep into flour and the whirling sound of my 14-year-old Kitchen-Aid mixer I’m taking to the stove. I always start out easy and get some things out of the way first since it only takes a few minutes to do, and it’s all worth doing! This 3-ingredient fudge recipe is the easiest thing to do, a kid can handle this one! I haven’t introduced the tot to the stove yet; she prefers to watch. So grab a stool for your kid to stand on and watch, or let them go for it! Some people do the glass bowl method over the saucepan to melt chocolate. I just throw it in the saucepan, but of course, being careful not to burn the chocolate or you’re going to have bits of burnt pieces in your fudge and that’s not cool. Throw in your stick of margarine and a bag of chocolate chips and stir away! Once it’s all melted, turn off the heat and remove the saucepan off the burner. Dump in your chocolate frosting and stir until it’s all combined. Sometimes I’ll use the fudge frosting to give it a more fudgy taste. 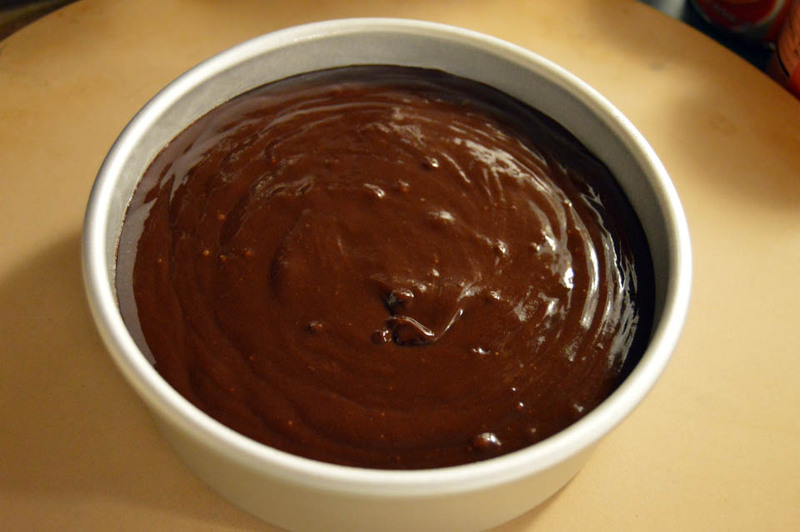 Once it’s all stirred up, grab your prepared 8×8 cake pan, or any small pan you prefer, and pour the fudge mix into it. Gently shake the pan side-to-side to get the fudge to spread to the sides. 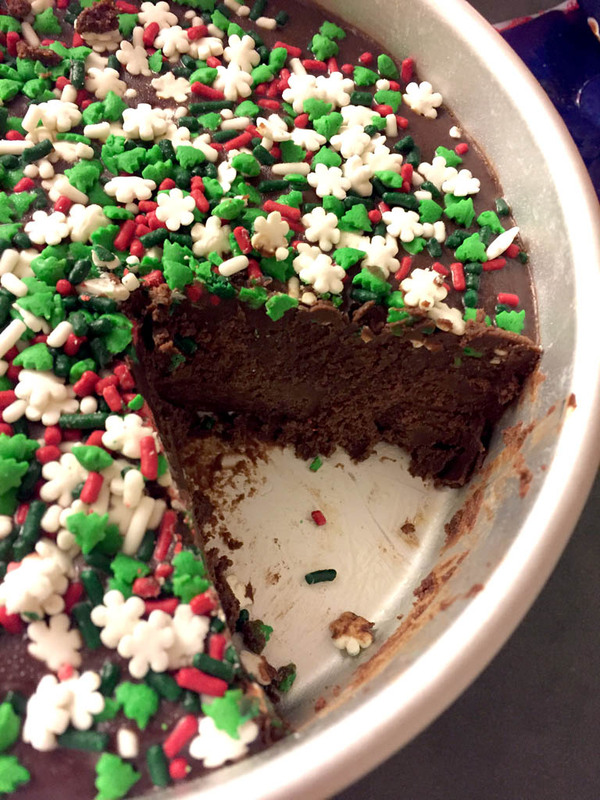 If you’d like, go ahead and give the fudge a festive feel by sprinkling some holiday sprinkles on top and let it set. Place the pan in your refrigerator to allow the fudge to set quicker, and then cut into squares. It’s that easy! To store in the freezer, I always cut into squares and place them in a freezer-friendly storage container. A rule of thumb: be sure you place wax paper in between each layer of fudge for storage or your fudge is going to all stick together. Now for the hard part: If you plan to pass out this fudge to your friends and loved ones, don’t eat it! If I were you go ahead and double up this recipe just so you can have some for yourself! The name says it all. It’s simple, it’s fudge, it’s delicious! Get the kids involved! 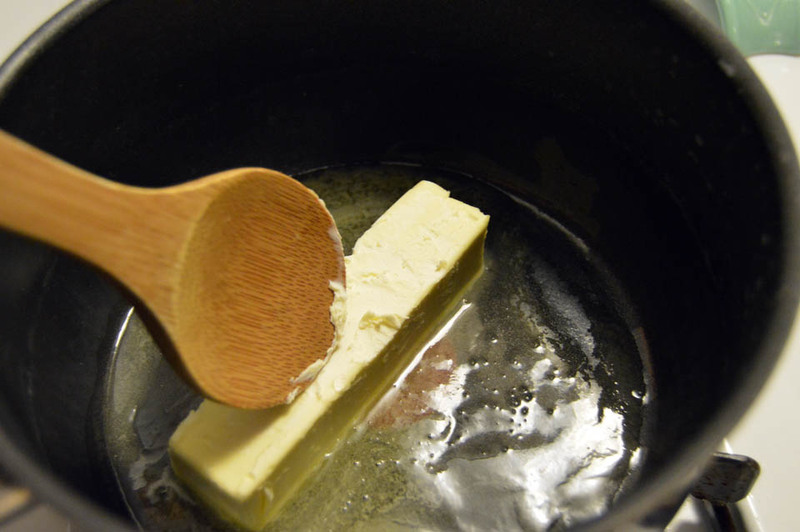 • In a medium saucepan, melt the margarine on medium-high heat. 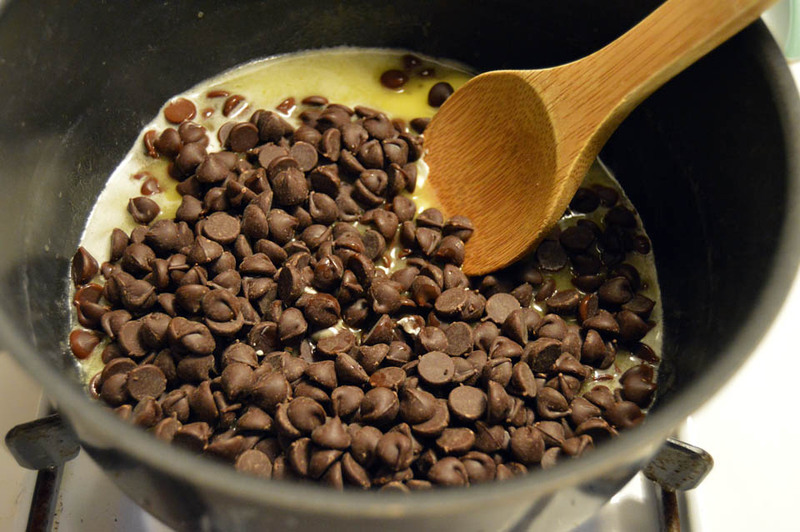 • Next, add the chocolate chips, and continuously stir morsels until melted and smooth. 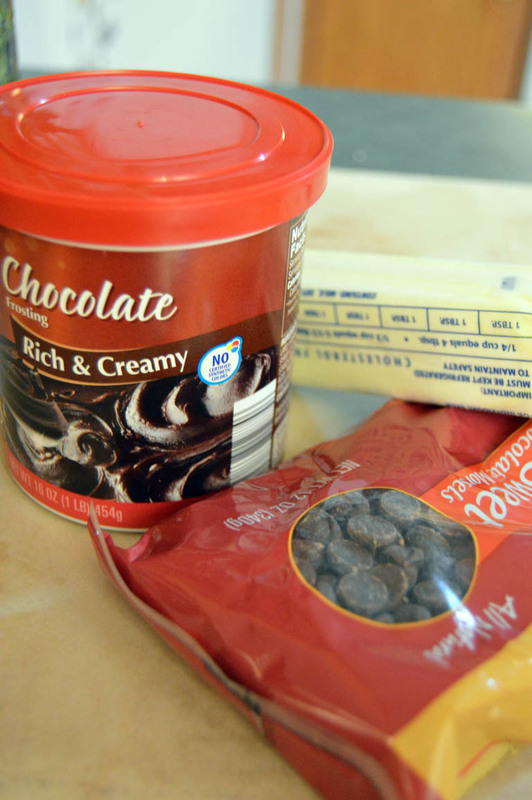 • Once chocolate chips are melted, immediately remove from heat and add the whole container of frosting; mix until well combined. 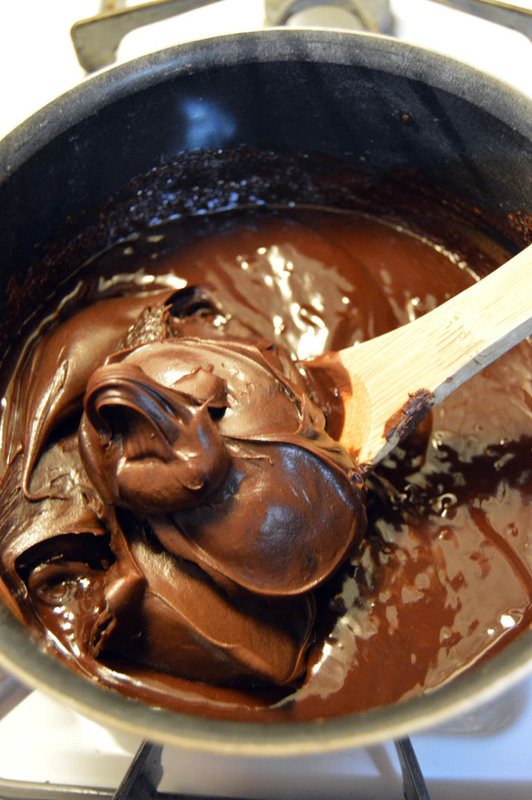 • Spray an 8×8 baking pan with non-stick cooking spray, then pour the fudge mixture into the pan. Gently shake the pan side-to-side to help spread the fudge to the sides. • Refrigerate until fudge is firm to the touch, about an hour or so. Cut into squares and serve, or store in the freezer in a freezer-safe container. 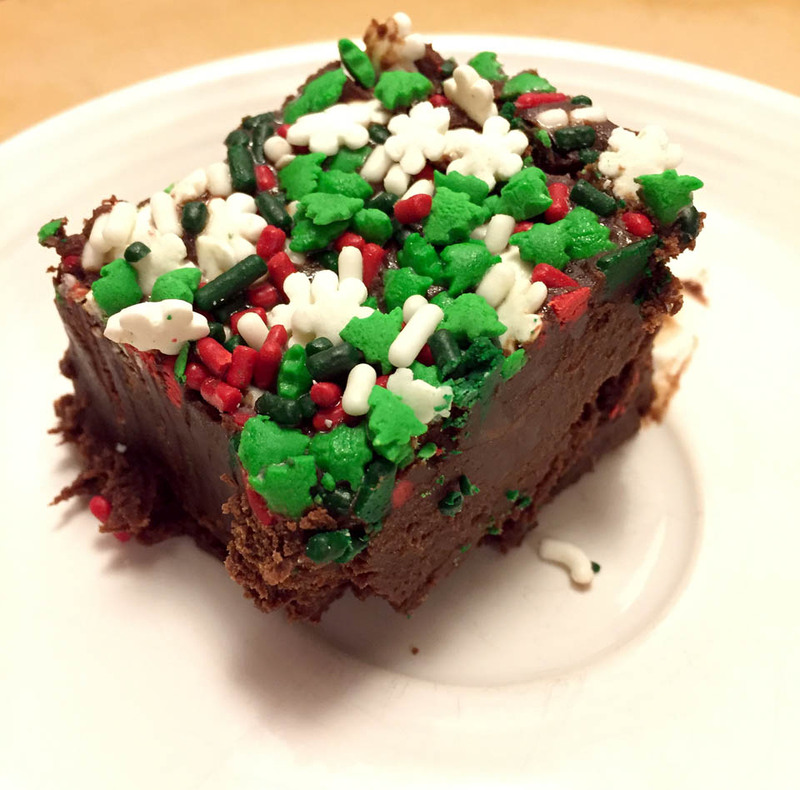 Be sure to place a piece of wax paper in between fudge squares if stacking. Next > Mini Walnut Pies – And Pretzel Pies Too!